Many first-time parents read and learn as much as possible while waiting for their baby’s arrival. It is definitely wise and for some couples, comforting to read and prepare. However, in real life, parents have limited energy and may not act or parent in the manner suggested in parenting books. 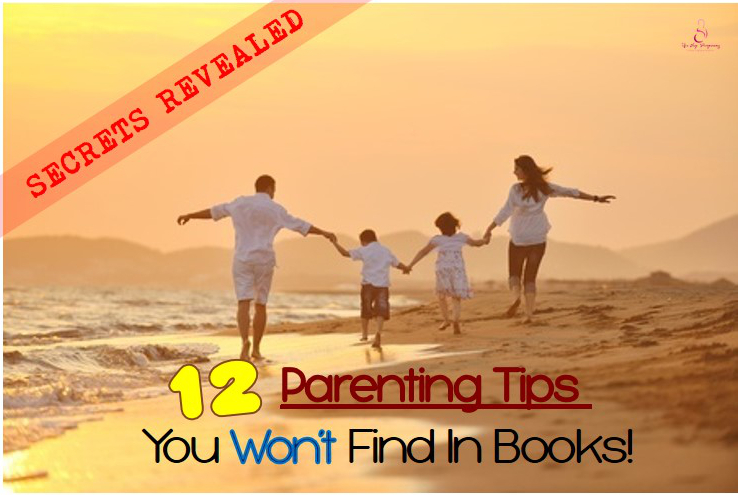 Here are 12 parenting tips that you will not find in books! Definitely help you to survive your day! As much as you try to be there 24/7 for your baby, there will be times when accidents happen when your head is turned. Baby may fall off the bed, fingers get caught in the door or swallow bits of the rubber ball. No matter what, you are the best parent for your child so there is no need to feel guilty over these accidents. Of course, baby-proofing your home is still a must! When you have a newborn baby, she can’t feed herself, change her own diaper and need help to fall asleep. 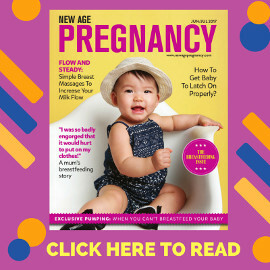 You’ve read about baby’s brain developing the most in the first few years and how important stimulating and interacting with the baby is. Your spouse? Surely he/she can take care of himself/herself. But NO – your spouse needs you, emotionally, to be there as life goes on (work, family, health issues) and a new baby is a huge adjustment for the adults too. Do not forget that postpartum depression is also applicable for fathers. There is no way to keep one’s sanity while always putting your baby’s needs before your own. Need a timeout for yourself? Get the crawling infant interested to fetch a toy placed a little distance away. Have a place that is without carpet or rug and let your baby make a mess – it is worth it if it gets your sanity back. There is a huge awareness on toxic chemicals, BPA and even books that are safe for biting. 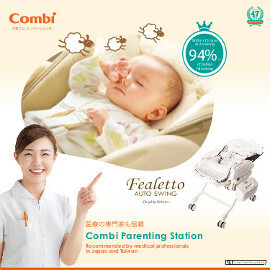 If you need to get grocery done and your baby looks like he is throwing a tantrum soon, get ready things (safe for baby) the he can play and even bite. If he ends up biting something he shouldn’t like a straw, don’t blame yourself (and know that many kids out there swallow bits of bitten straws!). Distraction is not the ideal way to parent because it does not teach your child the right behavior. However, it can be incredibly useful to avoid a tantrum, especially outside of your home or when you simply have no energy left to correct behavior. New toys, stationery or stickers work wonders to distract your child from doing something you don’t want him to do. Teaching your child to make healthy eating choices and habits is one of the parents’ gifts for their child. 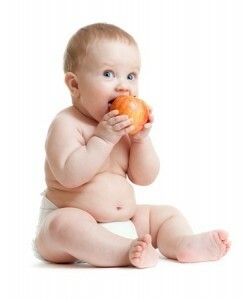 Childhood obesity is a growing concern and moreover, obesity is contagious. Thus, best thing is not to have junk at home – no soda, no sweet and no processed, trans-fatty chips! If you are one of those people that like to eat junk when stressed and parenting is stressful to you, hide the junk from yourself. Don’t start eating junk and doing so in front of your child will make it almost impossible to teach them not to eat junk later. To get your child to eat healthy, you can pretend yoghurt is ice cream and that colored vegetables are the best snacks in the world – even when you don’t think so. Such lies are OK and who knows, many parents eat healthier after they have a baby because only healthy food is served. Parents get a breather when the baby is asleep. However, you want them to be sleeping when you can do something with the time, not when you are stuck in the traffic jam or have to get through the grocery line. Try to keep your baby awake, even if you have to use more energy to entertain or play with your baby. It’s way better than not having that one to two hours to yourself at home later. If you are trying to get your toddler to do something he may not like it, make it fun or make it a race! Don’t want to go toilet? Let’s race to the bathroom! Don’t want to go to bed, first one in bed gets to sleep with the favourite bunny. There is much awareness about saving the earth and disposable diapers are really not environment friendly. If you find it impossible for you to use cloth diapers, don’t feel guilty. You may also find yourself using a lot of tissue to clean up mess, should you use a cloth instead? Forget it if you suspect making the few trips to the sink to wash the cloth is going to tip you over your sanity point. If you are in a restaurant and there isn’t anything you or the restaurant have to entertain your baby, ask for water with ice. Ice is pretty ‘cool’ – the baby feels that it is cool, it slides, it is slippery and it gets smaller and smaller with a growing puddle of water. It is also easy to clean up – it is way better for your baby to be playing with ice and attract a little attention than to be crying out loud and attracting a lot of attention (with no one thinking it is cute). Last resort – pretend dead (when your spouse is available). Spouses are to be supportive of each other and to share and talk it over when help is needed. However, in the middle of the night when you are really too tired to get up and your spouse is available, it is alright to continue being asleep. Just don’t overdo it. Above tips are more practical survival tips which will get you through a stressful day or situation. Some of them are not the ‘model’ parenting behavior but in reality, there will be situations when not everything can be perfect. Modern-Day Parenting Crisis – Why Parenting Is So Difficult?